While “less is more” is going to be the running theme in my wardrobe (and life) moving forward, “it’s all in the details” is also of major significance. You’ve probably noticed I’ve picked up a number of different pairs of black jeans lately – they’re universally flattering and transcend all seasons, so I feel it’s best to have options! You’ll see that each pair is very different from the last – one pair is a classic, high-waist skinny, another is a shredded boyfriend fit, a third has leather moto panels, and the last is a mid-rise skinny style with distressed accents. Now, to some people this may seem like a lot of silly spending on one kind of clothing, but to me, each pair of denim represents a different personality and works in different style scenarios. Also, with the exception of my favorite lululemon pants, I feel most comfortable in jeans. I wear them practically every day! The boyfriend fit is the most casual of all – an easy go-to for errands, lounging, weekend wear etc, but when you add a pair of pumps these jeans transform into an edgy going-out look. 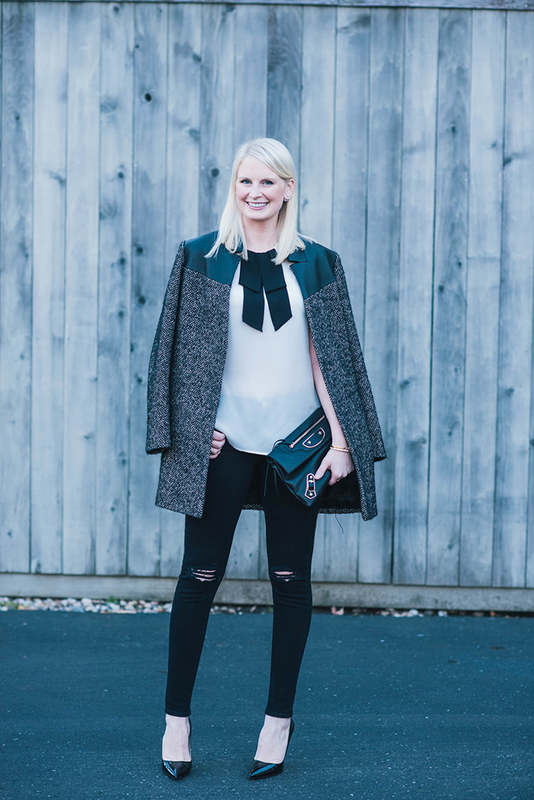 I would say my leather-moto J BRAND jeans are the polar opposite – the luxe leather detail make these the ideal option for nights out or when I’m looking for the dressiest end of the denim spectrum. For meetings or anything business related, my classic and clean high-rise style is what I grab. This pair is just great for everyday wear, day or night! Finally, when I want a flattering skinny fit, but also want more of a nitty gritty look, I pick up my J BRAND 620’s. 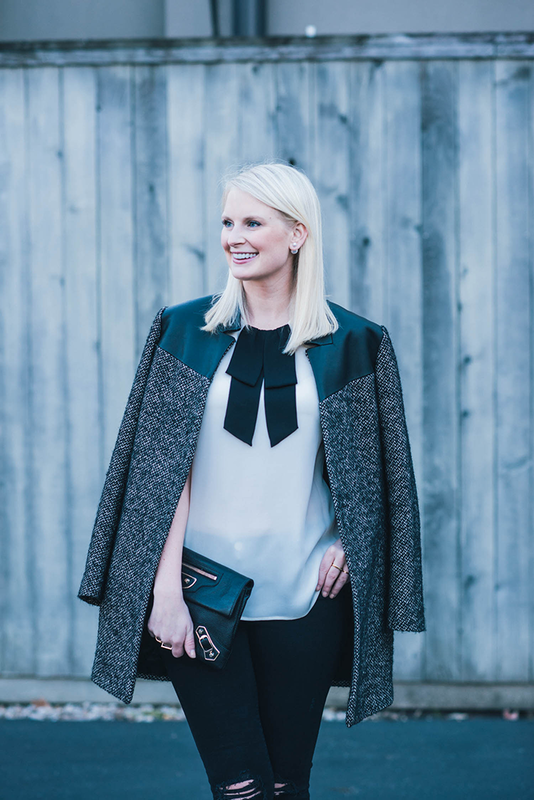 This is the pair I chose for a night out last Saturday – the tailored look on top (loving my new Theory blouse!) is a good way to offset the cool distressed look of the denim. Anyway, the point is I’m stocking up on year-round basics – timeless classics that will never go out of style. What are you hoping to add to your wardrobe this year? Love the fit of these jeans and adore this blouse. Have a great weekend! I have a pair of ripped black skinnies coming, and this makes me even more excited about them! I LOVE the shirt too. So classic. So chic and understated! 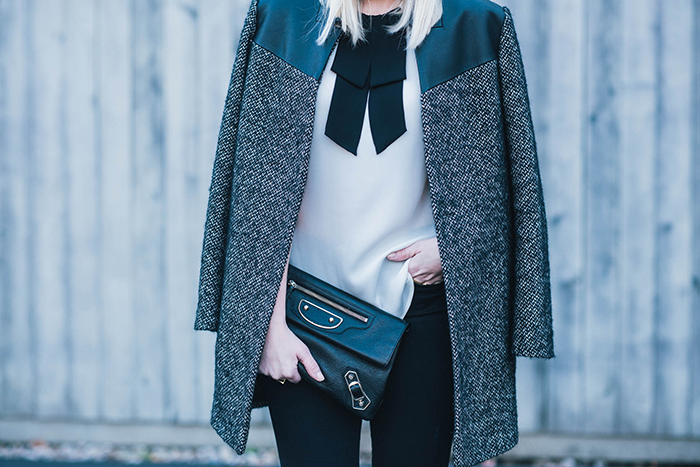 I love that coat and your blouse is incredibly flattering and feminine! The perfect day to night look! Nailed this look! Love it!!! Love this look, especially the sheer top! Looking gorgeous as ever! 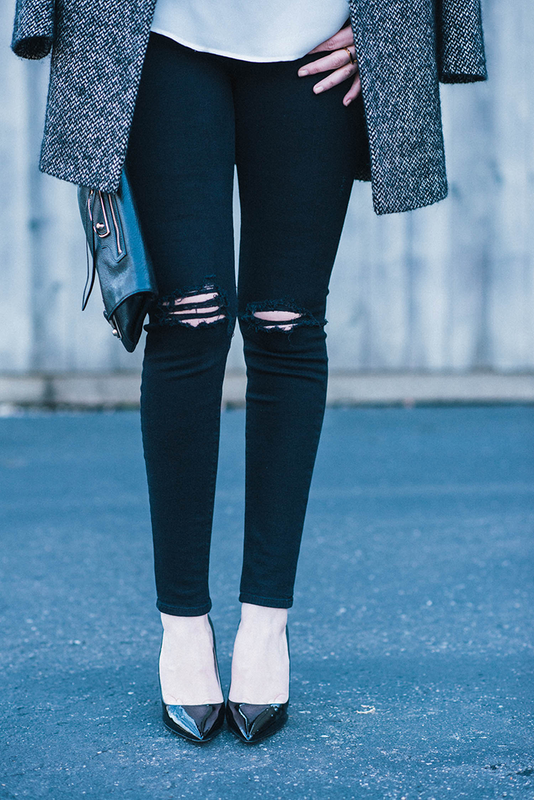 I’m obsessed with black ripped skinnies too .. my kneecaps are suffering in this cold but can’t help it! Completely adore this look!! You look beyond gorgeous! Such a chic look. The leather detailing on your jacket is perfection! la la loving your hair! How did I not know that you cut it! Great styling Merritt! This outfit makes your blue eyes pop! The whole look is perfection! Also, thanks for pinning my look the other day ;) That was very sweet of you. love this outfit on you! and want that blouse!!! Those jeans look amazing on you! The fit is incredible. Merritt! Hey girl… just getting back from a much needed blogging break. I missed your posts and need to catch up, but being unplugged was refreshing indeed. Your skinnys are perfection, and I’m loving that clutch. Black with gold details is always a fave of mine. Love that coat and top! The bow is so cute! You look so chic and I love the idea of having different jeans for different occasions!